When Roleen married Darling Creamery owner, Nicolaas Basson, in 1998, she moved onto the family farm, Alexanderfontein, just outside Darling in the Western Cape. This was the beginning of Darling Olives, which, today, is supplied by olives produced on 70ha on Alexanderfontein. Roleen divided the 50kg of olives into different batches to try different recipes. The next year she processed 100kg and cured black and Kalamata olives, which she sold at the local Spar and farm stalls. 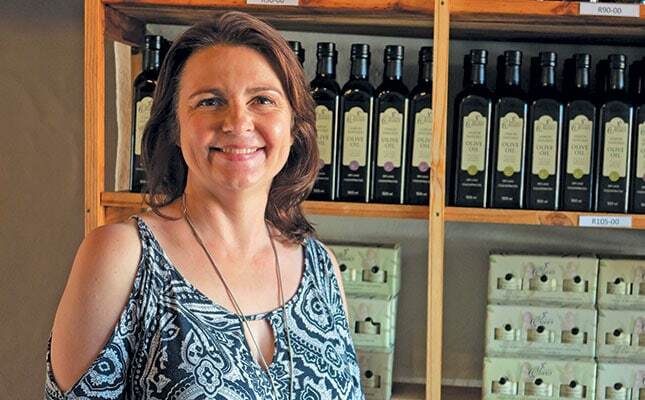 Roleen Basson, owner of Darling Olives. The business produces over 30 different product lines. “We started out in the old dairy building on the farm, which is now the tasting room,” she explains. By 2008, business had improved and Roleen appointed her first staff member. She now employs 13 staff members. The tonnage harvested from dryland olives is usually lower compared with irrigated olives, but olives produced under dryland conditions tend to have a more intense flavour. “We use one variety, Mission olives, because they are dual purpose for oil and fruit. They also do well on dryland,” says Roleen. Darling Olives’ first product was bottled olives, but soon thereafter Roleen developed an olive paste range. New product development is Roleen’s passion. “I won’t put something on the shop shelf that I won’t use personally at home. The flavoured olive oil [came about] because I got lazy on holiday, the antipasta is to [add to] a salad and keep things simple as you don’t always have fresh things on a farm, the salts are balanced so you don’t need other spices; I use them all. She also launched the Darling Olives online shop earlier this year. Roleen says she dreams about olives and wakes up in the morning with solutions to challenges. Olives are harvested from March to July. Roleen buys all the olives produced on Alexanderfontein, and says the transaction remains a strict business arrangement between Darling Olives and her husband. “I have to match the market price to secure all the olives from Nicolaas’ orchards. I also buy in olive oil varieties from other producers, and press the olives within 24 hours to get a high quality oil. While Darling Olives processed only 50kg in 2006, it now processes over 150 000kg a year. Durban in KwaZulu-Natal. The tasting room on Alexanderfontein is also an important market, and during the holiday season up to 850 people visit over a two week period. However, the olive oil and table olive sachets are still the business’ most popular products, as many South Africans still only use olives in Greek salads. This also means that the high season for olive sales is summer. Other product ranges are for sale at farm stalls and online. Roleen says that 80% of the products constitute 20% of the turnover, while the other 20%, which includes olive oil and table olive sachets, constitute 80% of the turnover. She refers to the added-value products as “nice to haves”, and is continually trying new products so that regular customers have different olive products to try. “We don’t only compete with other olive oil brands, but also against cheap imports. Oils that say ‘olive oil’ or ‘pure oil’ could be almost anything, but customers don’t always know this. SA’s olive oil industry is well regulated and producers are serious about quality. Roleen says that at the beginning of each year, targets are set, which Darling Olives hopes to not only achieve, but exceed. “If you stand still in business, you are actually going backwards,” she says. “You need to be getting ahead, making positive changes and being more productive. It’s not just about money, but all about progress. Her business motto is simple and effective: price, service and quality. Phone Darling Olives on 022 492 3171, email info@darlingolives.co.za, or visit darlingolives.co.za.